Pianist Keith Kirchoff, a virtuosic performer of new music who specializes in works for piano and electronics, will speak about his life as an independent performer and composer at 3 p.m. Friday, Nov. 7, in Souers Recital Hall. 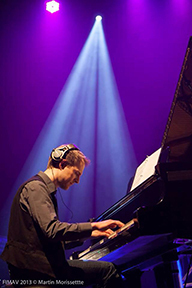 Kirchoff's talk, designed for musicians and general audiences alike, will focus on the entrepreneurial aspects that sustain the life of a musician in a major metropolis (Boston); his affinity for electronic concert music; and the impact this has had on his work as a performing pianist. Kirchoff will present a recital at 7:30 p.m., also in Souers Recital Hall. These pieces involve live electronics, video and motion sensing with an Xbox Kinect. Per Bloland, assistant professor of composition at Miami, was recently commissioned by Kirchoff to compose a new work for piano and electronics.